Because of the Million People March and because I wasn’t able to come to work earlier like the rest of my officemates, I asked the companion to fetch me up (at around 8:30ish) and stayed at the mall instead. We have to wait until the rally ends and until they open Ayala Avenue so we could go home safe and sound. As usual, the companion is starving so he asked me to have dinner with him. You see, I can’t eat much lately. Ewan ko din! It seems like my stomach shrunk. I get full easily and would get hungry after 2-3hrs. Which I guess is better because my OB keep on insisting (and well the mommy books also) that small frequent meals are the best for preggy momma. And that we shouldn’t wolf down so much food. But the companion is a heavy eater. He prefers restos/fast food that offers rice all you can. And he honestly could stuff his face with food good for 3-4 pax. So looking for the best place to dine in Greenbelt 3 is such a task! 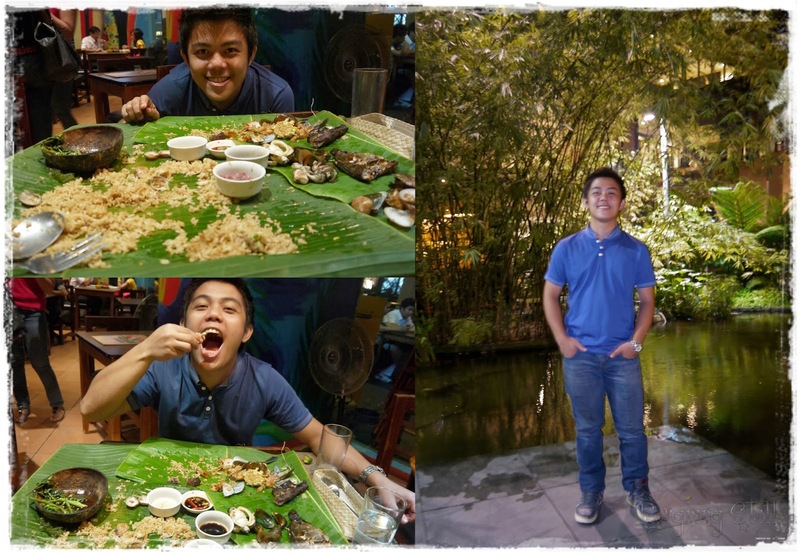 Great thing we came across Blackbeard’s Seafood Island Boodle Feast. We saw on the poster that they serve Boodle Feast good for 3-4 pax. We we’re supposed to just get the Binalot (which is served on a Bilao) but decided against it after seeing that the Boodle Feast looked yummier. We opted for Palawan Shores because the companion wants some crabs and I think this one has the most seafood in it. Unfortunately, we were told that they run out of crabs so we had it replaced with grilled pork. 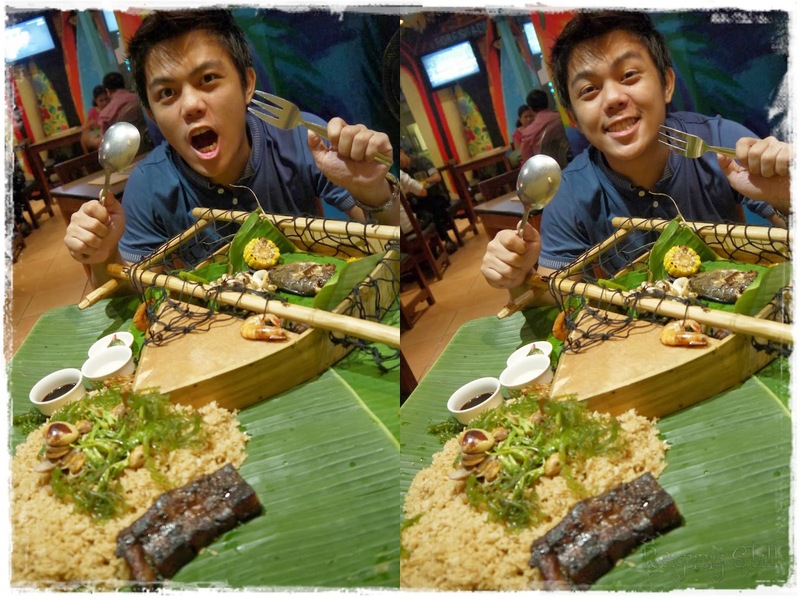 I love the presentation of the Boodle Feast. It sure looks soo much yummier because of the fancy presentation complete with those net and boat-like something. Overall dining experience is okay. I just had them replaced the lato that they serve because they gave us the stems which is so not edible for me. The lato was replaced with kangkong which is okay because their kangkong is fresh and goes well with the bagoong that they serve. The food is delish and we really enjoyed our dining experience, especially the companion who had a great time eating those humongous serving of rice. I just had to stop early because I’m so full already, my tummy feels like bursting. I think it’s sulit considering the price. And since I really think 3-4 persons would enjoy this much goodness. I highly recommend this place for those barkadas out there. Anyway, allow me to share with you some photos of the companion that night. I love that kid-like smile of his. Minsan nakakabwiset din pero most of the time I love it. Nyaks! You see, everytime I’d think of the companion, I can’t help but feel lucky. Having him in my life is such a huge blessing. I am not easy to be with in the first place. I have this very strong personality that I think no ordinary man can live with. But he just knew how to deal with me. Don’t get me wrong, he’s not perfect. Oh believe me he’s far from being one. Sometimes, I ask myself why I even love this man. But then he’d do something that’ll remind me how lucky I am for having him. And the best part is, he loves me. I know he does. And he loves our little peanut so much, he’s willing to endure the nastiness of the mother. Cheeseballs!!!! And you know what the best part is?? He knows how to take fashion blog-worthy photos!! And he’s willing to do that despite the stares of the many people at the mall. Anything to make his bitchy girlfriend happy.